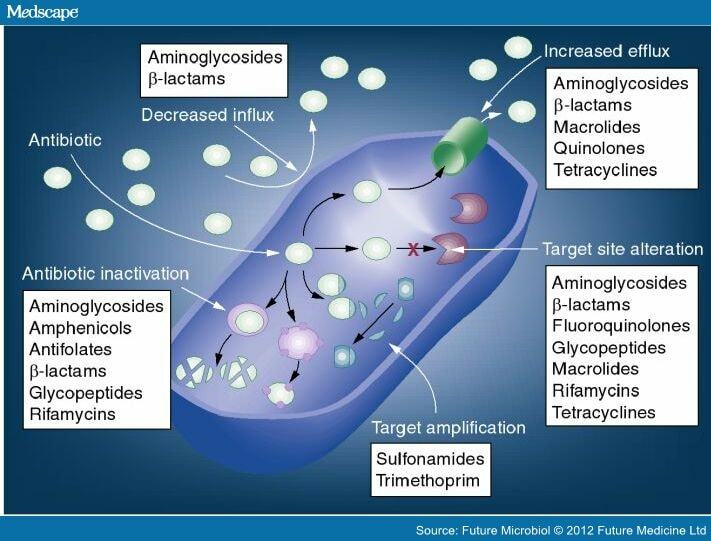 Q2 in our JMO pre-test asked: “What is the main mechanism by which the bacterium Staphylococcus aureus becomes resistant to penicillin?” We gave alternatives enumerating basic mechanisms that micro-organisms use (often in combination) to become resistant to an antimicrobial agent (graphic below). Production of penicillinase (i.e. inactivation by a type of beta-lactamase) was the correct answer– more than 80% of local methicillin-susceptible S. aureus is penicillin resistant by this mechanism. This post explains how to extrapolate penicillin and other antibiotic susceptibilities to related agents. Local (HNE) cumulative antibiograms are available on this website and provide detailed information on susceptibility of S. aureus to other antibiotic classes, including the prevalence of MRSA (resistance is by target site modification) across HNE locations – a summary of 2015 data is here. The emergence and spread of MRSA is quite a story – not just a single species, but rather many different clones with differing pathogenic potential and epidemiology. For more, see this posting from our sister ID/Micro blog. Staphylococcus aureus is one of the commonest pathogens causing community and healthcare-associated infection- worthy of study! Be systematic – this proforma (Infectious Diseases 101- see under point 1) is useful for assembling your knowledge. Image: Gram stain of Gram positive cocci in clusters = staphylococci. Williamson DA et al. Staphylococcus aureus ‘Down Under’: contemporary epidemiology of S. aureus in Australia, New Zealand, and the South West Pacific. Clin Microbiol Infect. 2014 Jul;20(7):597-604. Nimmo-G et al. Methicillin-resistant Staphylococcus aureus in the Australian community: an evolving epidemic. MJA 2006; 184: 384–388. ← Antibiotic classes – why so important to know about them?